Due to the nature of handcrafting, mats may vary slightly. Thick-pile bath rugs with white center and colored border. Available in, listed front to back, Denim (featured), Ivory, Light Green, Linen, Aqua, Atmosphere (gray), or Gold. Made in Portugal of cotton. Machine wash.
Thick-pile bath rug with white center and colored border. Available in, listed front to back, Denim (featured), Ivory, Light Green, Linen, Aqua, Atmosphere (gray), or Gold. Made in Portugal of cotton. Machine wash.
White cotton canvas shower curtain is detailed with embroidery and tassel trim in your choice of colors. 72"Sq. Dry clean. White cotton canvas shower curtain is detailed with embroidery and tassel trim in your choice of colors. 72"Sq. Dry clean. Imported. Liner not included. 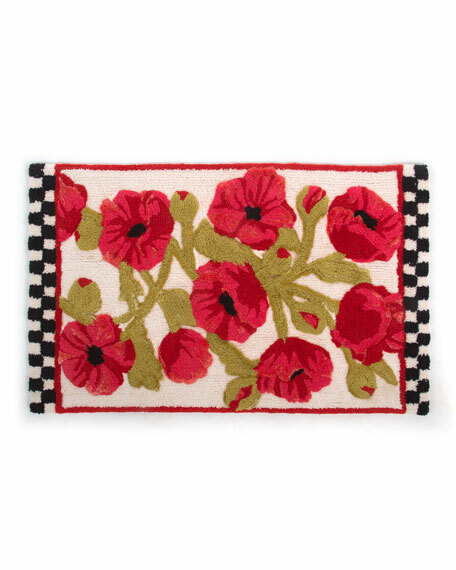 Handcrafted cotton bath rug. Pieces may vary due to the handmade nature of each product. Machine wash cold on the delicate cycle. Tumble dry low. Shake out to retain fluffiness. Trim loose ends with scissors. Imported.